Microvascular angina is defined as angina-like chest discomfort with normal epicardial coronary arteries, which is due to coronary microvascular dysfunction. The condition is most prevalent in perimenopausal or postmenopausal women, but is rare in young women. Here, we report the case of a 16-year-old female who complained of chest discomfort during exercise and was diagnosed with microvascular angina. Exercise stress-induced chest discomfort was not relieved by nitroglycerin treatment. Exercise thallium-201 myocardial scintigraphy showed a perfusion defect in the anteroseptal wall. Although there was no significant stenosis or vasospasm in the epicardial coronary arteries on angiography, an ergonovine spasm stimulation test induced chest discomfort and delayed distal vessel opacification in the left anterior descending coronary artery. Concomitant treatment using carvedilol and diltiazem in addition to exercise limitation reduced the frequency of chest pain. Improvement was also seen in exercise scintigraphy perfusion defects. Recent evidence challenges the assumption that microvascular angina is a benign condition; therefore, early treatment may be particularly important in young patients. Physicians who examine young patients with angina-like chest discomfort should consider a possible diagnosis of microvascular angina. In patients with angina, 10–30% are found to have no coronary stenosis when undergoing angiography and, historically, these patients were diagnosed with cardiac syndrome X (CSX). However, current evidence shows that a significant proportion of these patients have microvascular dysfunction, characterized by limited microvascular vasodilator capacity and heightened sensitivity to vasoconstrictor stimuli, and such patients are now given a diagnosis of microvascular angina. Initial studies suggested that patients with CSX have a good prognosis. However recent investigations, such as the Women’s Ischemia Syndrome Evaluation (WISE) study,1) have shown significantly higher rates of cardiovascular events in patients with nonobstructive coronary artery disease. While microvascular angina is prevalent in menopausal women, there are few reports in pediatric patients. Here, we present the case of a 16-year-old female with microvascular angina whose symptoms were improved with medication. 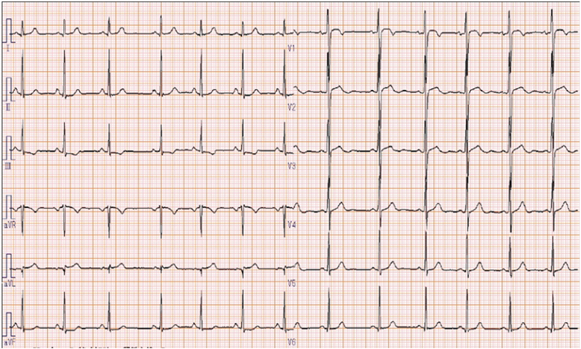 A 16-year-old female presented with exertional chest pain. Her past medical history showed premature birth at 33 weeks’ gestation, but no risk factors for ischemic heart disease, including Kawasaki disease, hypertension, obesity, and smoking. Her mother had a history of papillary thyroid tumor and adrenal tumor. The patient was a member of the track and field club in junior high school; in the third grade, she began to experience chest pain during exercise. She presented to a general practitioner and was diagnosed with dysautonomia. Her chest pain was relieved without medication after retiring from the track and field club. When she was in the first grade of high school, ST depression in the electrocardiogram (ECG) was noted during a school health examination. Her chest pain recurred when she returned to track and field sports, where vigorous exercise induced chest pain, which lasted for a few hours. On physical examination, the patient’s heart rate was 70 beats per minute and her blood pressure was 107/58 mmHg (systolic/diastolic). Her height was 152.3 cm, her weight was 44.6 kg, and her body mass index was 19.2. Cardiac examination revealed normal S1 and S2 and no discernible murmur. No apparent abnormalities were detected on X-ray and laboratory testing (including B-type natriuretic peptide, human atrial natriuretic peptide, troponin-I, HbA1c, triglycerides, cholesterol, renin-angiotensin system, and catecholamine). ECG showed subtle ST depression (<0.1 mV) in inferior leads (II, III, and aVF) and subtle ST elevation (0.2 mV at maximum) in the anteroseptal leads (V1–3). The T-wave was inverted in lead III and flattened in lead aVF (Fig. 1). Transthoracic echocardiography showed no abnormalities. A treadmill exercise ECG test was performed according to the standard Bruce protocol. During stage 5, chest pain was induced and the ECG showed nonspecific upsloping ST depression in the inferior leads (II, III, and aVF) and subtle ST elevation in the anteroseptal leads (V1–3; Fig. 2). ECG alterations disappeared after a few minutes’ rest, but chest pain persisted for approximately 15 minutes and was not alleviated by nitroglycerin treatment. 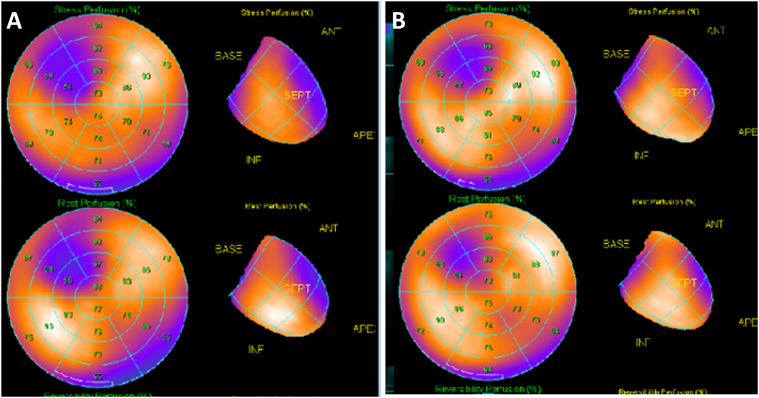 Exercise thallium-201 myocardial scintigraphy showed perfusion defects in the anteroseptal wall, which improved during the resting study in the peripheral regions, but not in the central areas. The minimal concentration of tracer in the perfusion defects was 55% of that in normal regions (Fig. 3A, B). 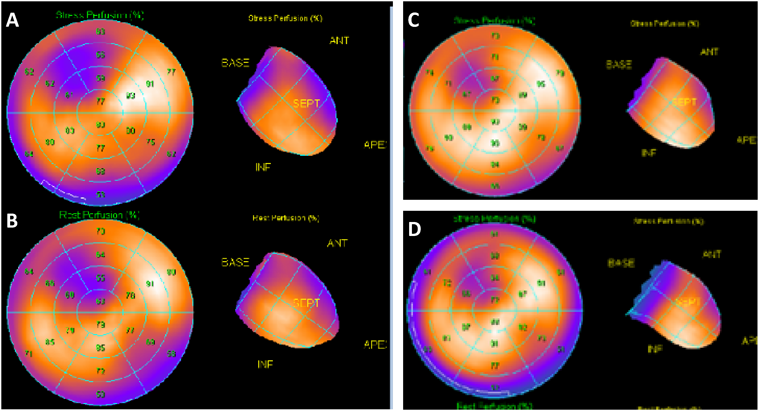 Resting thallium-201 myocardial scintigraphy and 123I-BMIPP scintigraphy were performed on different days, and both revealed perfusion defects in the anteroseptal wall, with observed perfusion defects being greater on 123I-BMIPP scintigraphy (Fig. 3C, D). Left ventricular function was evaluated with echocardiography during intravenous adrenaline infusion (0.1 µg/kg/min after 0.1 mg/kg bolus administration). Chest pain was induced shortly after adrenaline infusion, and reduced regional systolic wall thickening was noted in the anteroseptal wall. A cardiac computed tomography (CT) scan showed no abnormalities of the coronary arteries. However, 4D-CT revealed hypokinesia and thinning of the anteroseptal wall (Video 1). During coronary angiography, the patient complained of chest discomfort when the venous catheter was moved within the right atrium, but no significant stenosis was observed in the epicardial coronary arteries. 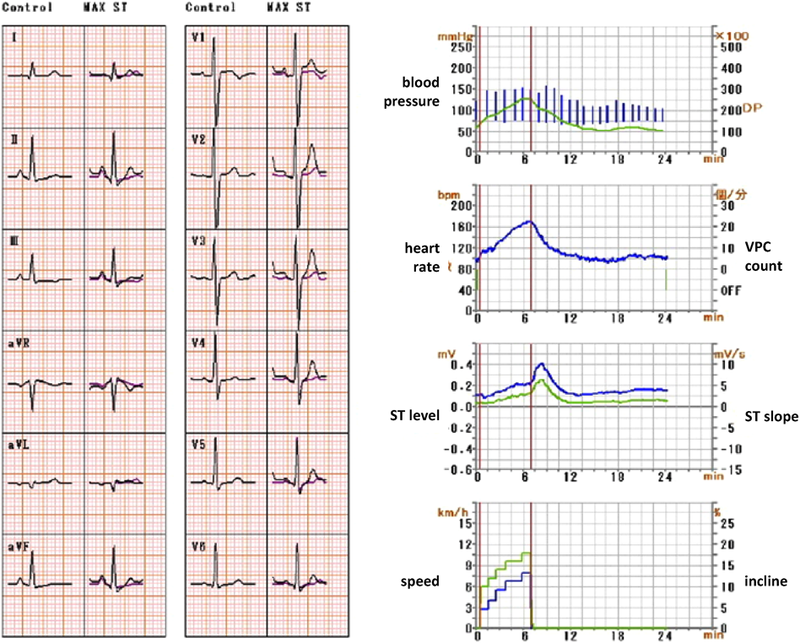 An ergonovine spasm stimulation test induced chest pain, and ergonovine infusion into the left coronary artery was followed by significant ST depression in the inferior leads (II, III, and aVF) and ST elevation in the anteroseptal leads (V2–4). Coronary spasm was not induced, but delayed distal vessel opacification was noted in the left anterior descending (LAD) artery (Video 2). After a few minutes, ECG alterations and delayed distal vessel opacification disappeared spontaneously, although the chest pain persisted for a few hours. 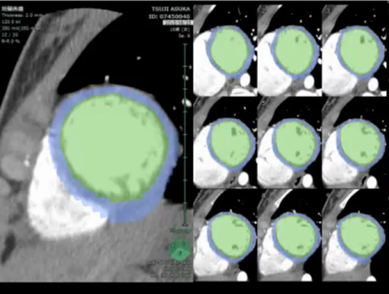 Video 1 4D computed tomography shows reduced wall thickness and systolic wall thickening in the anteroseptal wall. Video 2 There was no significant stenosis in the epicardial coronary arteries on angiography (A). However, ergonovine spasm stimulation test induced chest discomfort and delayed distal vessel opacification in the left anterior descending coronary artery (B). Electrocardiogram during the ergonovine test showed significant ST depression in the inferior leads (II, III, and aVF) and ST elevation in the anteroseptal leads (V2–4)(C). The patient was diagnosed with microvascular angina on the basis of myocardial scintigraphy, which indicated myocardial ischemia despite the absence of stenosis or spasm of epicardial coronary arteries. Atenolol (50 mg once daily) was administered, but failed to alleviate the symptoms, and chest pain was experienced more frequently during the winter. After 4 months, thallium-201 myocardial scintigraphy showed exacerbation of ischemia in the anteroseptal wall (Fig. 4). Therefore, medication was changed to carvedilol (10 mg twice a day) and exercise was prohibited. However, chest pain did not improve, and 2 months later, diltiazem treatment (100 mg, once daily) was introduced to the ongoing carvedilol regimen. The patient’s symptoms gradually improved, and 3 months later, thallium-201 myocardial scintigraphy showed a reduced ischemic area (Fig. 4). The pathogenesis of microvascular angina is thought to be reduced coronary flow reserve (CFR) and coronary microvascular spasm. CFR is the capacity of the microvasculature to dilate in response to vasodilator stimuli. When CFR decreases, the coronary microvasculature cannot dilate sufficiently on exertion, leading to demand-type ischemia when blood flow demand exceeds supply. Coronary spasm tends to develop at rest, and persist for some time. Therefore, microvascular angina can develop both on exertion and at rest and often persists for more than 10 minutes, with some reports documenting symptoms for over 12 hours. The patient reported here presented with exertional chest pain that persisted for a few hours. This is consistent with microvascular angina, which encompasses the following criteria2): 1. Angina-like chest discomfort, 2. Ischemic findings on examinations such as ECG and scintigraphy, 3. No epicardial coronary stenosis or inducible spasm at angiography, 4. Absence of cardiac or systemic diseases associated with microvascular dysfunction, such as hypertrophic cardiomyopathy or diabetes. However, confirming the diagnosis can be complicated by the fact that typical ischemic findings on examination are absent in many cases. This is because, unlike obstruction of the epicardial coronary artery, which leads to regional cardiac ischemia from the endocardium to epicardium, microvascular angina develops cardiac ischemia in mottled regions without regard to epicardial coronary distribution.3) In this case, findings of the 12-lead ECG and exercise ECG were not notable and could be regarded as normal. However, because the patient’s symptoms were too severe to be ignored, scintigraphy was performed, which suggested cardiac ischemia and infarction in the anteroseptal wall. Based on the findings of scintigraphy, subtle ST elevation in the V1–2 lead might suggest that anteroseptal cardiac ischemia and ST depression in leads II, III, and aVF are a mirror image. During angiography, the ergonovine spasm stimulation test induced chest pain, ST elevation in the leads V2–4, and delayed distal vessel opacification in the LAD artery. Scintigraphy and angiography findings suggested microvascular dysfunction in the LAD artery. In addition, this patient had no systemic disease, such as diabetes and hyperlipidemia, and cardiomyopathy was ruled out on the basis of diagnostic criteria. The patient was, therefore, diagnosed with microvascular angina. The scintigraphy results in this patient were distinctive, being round in shape, and although the scintigraphy suggested significant cardiac ischemia, there were few abnormalities in the ECG, ultrasonography, and 4D-CT. We believe that these findings suggest that myocardial ischemia developed without regard to the distribution of epicardial coronary arteries, and ischemic and normal myocardia existed in a mosaic pattern in the cardiac muscle layer, as is consistent with the characteristics of microvascular angina.3) However, some findings, such as the ST elevation at ECG and persistent perfusion defects at the scintigraphy, are not typical of microvascular angina. Coronary microvascular dysfunction develops in other diseases, such as cardiomyopathy.4) In our case, cardiomyopathy was ruled out on the basis of current diagnostic criteria, but we consider that follow-up should be conducted to monitor the possible development of cardiomyopathy. During cardiac catheterization, our patient experienced chest pain when the catheter was moved into the superior vena cava and right atrium. This was of particular interest because the same phenomenon is often observed in patients with CXS, and hyperawareness of changes in the right atrium is the basis of the pain sensitivity theory of CXS.5) Initial investigations suggested that patients with CSX had a good prognosis, but recent studies showed significantly higher rates of cardiovascular events, especially in patients with reduced CFR.6) Although the CFR of our patient was not evaluated, we considered her to be at high risk of cardiovascular events on the basis of the available examination results, and decided to initiate active treatment. The management of patients with microvascular angina includes pharmacological treatment and lifestyle modifications, such as exercise, weight loss, dietary change, and smoking cessation.2) Pharmacologic treatment involves the use of conventional antianginal drugs, such as nitrates, β-adrenergic receptor blockers, calcium channel blockers, and angiotensin-converting enzyme inhibitors. However, these drugs have limited efficacy in the management of microvascular angina, and there is no proven alternative therapy. In Japan, calcium channel blockers are most commonly used, which are thought to be effective due to their negative chronotropic and inotropic effects (which result in reduced cardiac oxygen consumption), in addition to their efficacy in preventing coronary spasm.7) However, in other countries, β-adrenergic receptor blockers are more frequently administered as some studies showed negative results with calcium channel blockers,8) and β-adrenergic receptor blockers were seen to be more effective.9) A β-adrenergic receptor blocker was first prescribed in our patient, but symptoms deteriorated (possibly due to exacerbated vascular spasm) and treatment was switched to a calcium channel blocker, which resulted in symptom improvement. We report the case of a young patient with microvascular angina. Increasing evidence shows that some patients with CSX have microvascular dysfunction and their prognosis is not always good. Pediatric patients with microvascular angina are very rare, so we believe this case is important to clarify the long-term prognosis of this condition. In addition, this case highlights the need for physicians to consider the possibility of microvascular angina when examining young patients with angina-like chest pain.